This year, we have seen two disasters cause unimaginable devastation in Mexico and Puerto Rico. An earthquake measuring 7.1 on the Richter scale occurred on Sept. 19 in central Mexico, as the country was still reeling from an 8.1 earthquake on Sept. 8, just off the country’s southern coast. More than 250 people were killed and many buildings were reduced to rubble. 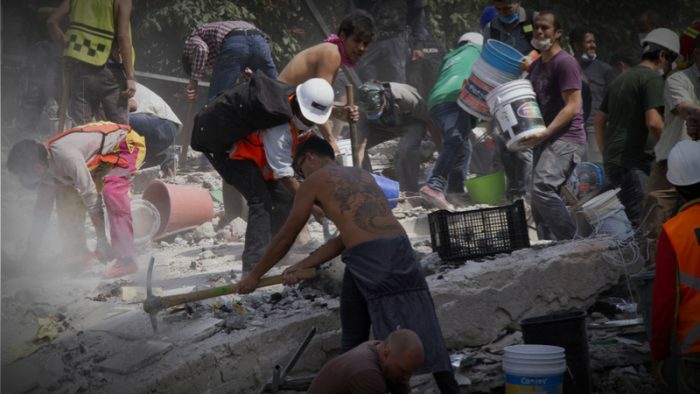 The earthquake — the most powerful to hit the country in a century — was felt as far as Mexico City and Guatemala City, and has caused significant damage and deaths in Oaxaca and Chiapas. ICF is working with local organizations in these regions to cover short term basic needs and longer term reconstruction costs. The funds will go directly to nonprofits working on recovery efforts in Mexico City, Puebla, Morelos, Chiapas, and Oaxaca. HIPGive will not charge an administrative fee for transferring funds. Center for Disaster Philanthropy has put together a profile page with resources, donors and nonprofits serving the effected areas. The devastating effects of hurricane Maria on Puerto Rico are still unfolding, but one thing is certain—the island’s most vulnerable communities are likely to be pummeled the hardest and face the longest road to recovery. The Fund will be housed at the Center for Popular Democracy (CPD). One hundred percent of monies raised will be used to support immediate relief, recovery, and equitable rebuilding in Puerto Rico for the communities hit hardest by the storm. The Fund is governed by organizations like Puerto Rico-based Taller Salud and other local, grassroots organizations. Hurricane Relief Fund For Puerto Rico, Cuba, and Florida Right now, people in Cuba, Puerto Rico, and Florida need our help. HIP created this fund so that our community can support those affected by Hurricanes Maria and Irma. 100% of donations to this fund will go exclusively to long-term relief for the victims of catastrophic Hurricane María in Puerto Rico. This fund has been organized and is managed by the non-profit ConPRmetidos in partnership with Foundation for Puerto Rico, a 501(c)(3) corporation, which is acting as the fiscal sponsor. Taking a devasting hit to Puerto Rico, Hurricane Maria’s full impact is still to be assessed but we do know Puerto Rico will need significant resources to rebuild its infrastructure with 100% of its electrical grid knocked out, cell phone towers destroyed and many towns cut off by landslides. If you are looking for opportunities to learn and connect with others interested in the topic of Disaster Relief, take a look at these events, galas, conferences and volunteering opportunities aggregated by Giving Compass. Disaster Relief is an important topic. Other members found these Giving Funds, Charitable Organizations and Projects aggregated by Giving Compass to be relevant to individuals with a passion for Disaster Relief.